Our bedrooms are spacious and comfortable. They are all en-suite and equipped with all of the expected modern amenities – including flat screen satellite televisions, tea and coffee making facilities, large comfortable beds and fluffy towels. WIFI is available in most rooms*. Many of our rooms enjoy riverside views **. 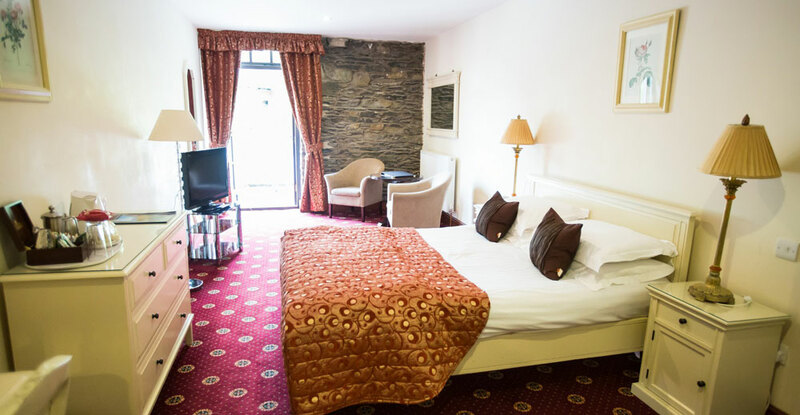 There are four room types offered ranging from standard, classic, superior and Executive or four poster rooms. There is a selection of rooms to suit all needs and budgets. To see more photos of our rooms please click here. We also cater for guests with special requirements, please contact us and we will offer the room that best suits your particular needs. Special rates are available for corporate guests, wedding party guests, even at weekends. Complimentary overnight accommodation is provided for the wedding couple as part of our all-inclusive wedding package. There are special rates for children sharing with adults. Children in their own rooms are charged 75% of the full rate. There is no charge for cots and under 3’s. To reserve your room(s) today please visit our online booking or call/fax the numbers displayed at the bottom of this page. If you are interested in renting one of our self-catering Riverside Cottages or apartments please call the hotel direct. This availability does not appear on our website so you must call the hotel to enquire or submit an enquiry here. These units are 5 star rated and superbly furnished. Satellite TV, fridge/freezer, cooker, washing machine, dishwasher, real coal fires etc etc. Would you like to make the Whitewater Hotel and Leisure Club a regular holiday destination? Why not become a member of Heritage Resorts? To find out more take advantage of our Trial Membership Offer. Occasionally we offer special seasonal rates, please check our special offers. View our non smoking policy.